Ask your students if they have ever seen anyone start to cry in the kitchen while preparing a meal. It could be because the person doesn’t want to make dinner, but it’s more likely something that the cook can’t control. Or can it be controlled? Many recipes start with onions and garlic as a base. The person making the meal will chop these ingredients before beginning to prepare a recipe. When you see someone begin to tear up when chopping an onion, there’s actually a scientific reason behind it. Onions are considered to be root vegetables as the entire bulb is grown in the ground. The onion grows to maturity according to the scheduled amount of daylight. Different varieties are grown across the country. When planted, the onion has green stalks that grow above the ground, and the bulb is below soil level. The onion plant that is allowed to grow for the longest amount of time will produce the biggest bulb. Now, ask your students what vegetables can be grown in a garden. Make a list of the answers. Go over the list and ask what makes an onion different from the other vegetables? Explain that you can chop, with a knife, all the vegetables you grow in a garden or buy at a market. But, when you slice into the onion you will start to produce tears as you work with it. This is where the science comes into your lesson. Tell your students that when onions are busy growing they are drawing in sulfur from the soil. Ask your students to come up with possible reasons why the process of cutting the onion would cause someone’s eyes to make tears. Give your students some onions to touch and observe. Share with your students that when you start to slice an onion you are cutting and separating the cell walls of the onion. Until that moment, some enzymes in the onion have not mixed with each other, or the surrounding air. When you slice an onion the enzymes and amino acid sulfoxide chemicals are now free to mix together and form a gas. This is what produces the potent smell of an onion. The gas created from this mixture slowly starts to waft up and reach the eyes of the person cutting the onion. The resulting gas mixes with the water in your eyes to create a stinging sensation and tears. 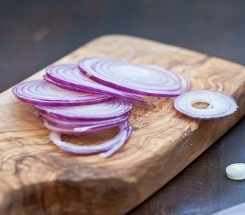 The tears formed when slicing an onion are a kind of reactive tear. The lachrymal glands, located near the tear ducts in the eye, produce tears to flush out any irritant like dust or smoke. In this case, the irritant is the gas created from the enzymatic reaction of slicing an onion. The tears are the body’s natural defense to flush out the irritant once the gas reaches the eyes. In conclusion, have a discussion with your students about the results. Guide the discussion to explain how chilling the onion reduces the chemical reaction that takes place when the onion is cut. The reaction of the enzymes is not as strong when they are cold. Scientists are also working on a variety of onion with lower levels of the enzymes that produce the tears when the onion is cut. Tell your students they can share what they learned about slicing a chilled onion, to avoid tears in the kitchen, with the cook in their home. The cook will be happy to get such a tip!